Wedding Anniversaries are an elaborate affair, ones that demand elegant ambience with coordinated magnificent settings, that brings out the beauty of years of love, commitment and the underlying couple personality. 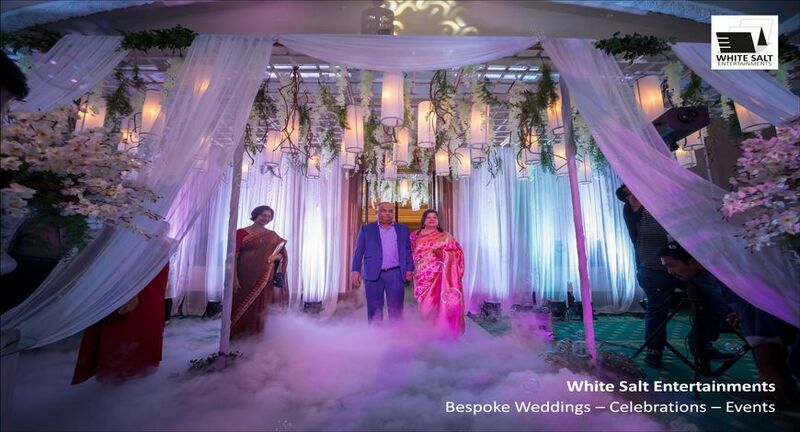 White Salt Entertainments recently organised the grand celebration for a high profile client at Kolkata’s ‘Quaint Old Dame’ – The Oberoi Grand. Everything about the celebration event was planned bearing in mind that the client had an array of business and corporate colleagues attending the celebration. Right from the venue, to the quaint ballroom, the event floor-plan and the decor aesthetics – each element was planned carefully. As part of the aesthetic setup, a striking mid-ballroom overhead with crystal hangings, natural greens and baby’s breath or gypsophila was suspended, bringing out the essence and grace of the occasion. The couple stage was done up elegantly in white chiffon drapes and was beautifully complimented by a grand entrance walk in into the ballroom, graced with dense white blooms and ferns. Large candelabras adorned with delicate florals from Bangalore were made to elegantly sit across round tables at the venue and light up with naturally amber candles. The gorgeous evening was brought to life by Band Farmaish of Kolkata, performing a personalised and carefully selected list of classic bollywood and golden era hits. There was a special cocktail arrangement made for guests in the boardroom, separate from the party venue to ensure family members and teetotallers were comfortable. All in all, a seamless events experience, White Salt Entertainments once again exceeded client expectations.